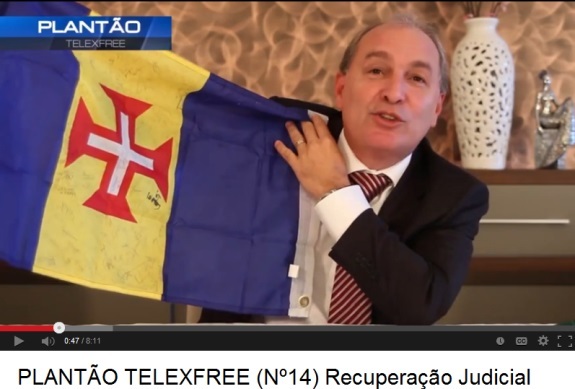 Carlos Costa displays the flag of Madeira while announcing TelexFree is seeking bankruptcy protection. UPDATED 7:21 A.M. ET Jan. 21, 2013, to correct misspelling. With pyramid-scheme probes under way in multiple Brazilian states and affiliates also filing actions against the company, TelexFree says it is seeking bankruptcy protection in Brazil. Early details are sketchy. TelexFree operates in Brazil through Ympactus Comercial Ltd. The firm has U.S. arms in Massachusetts and Nevada. Affiliates appear to have established TelexFree-related firms in Florida and California. Shocking that people still believe in this ponzi. Amazing and sad. I’ve done a quick business case assessment of this, and this scheme might be well designed to recruit new members, but it lacks neither a viable product, nor a sustainable cash flow. I built a basic spreadsheet model of this. The leadership makes 1000 times more than the top tier of earners and is constantly about 10 weeks away from zero cash as long as they have a semi-geometric growth rate.